Poor oral health has been linked to several general health chronic illnesses, including pneumonia, prostate cancer, stroke, heart disease, problem pregnancy, diabetes, and breast cancer. But how many Americans are actually at risk? In today’s health aware society with a multitude of elaborate toothpastes and oral hygiene tools, it is easy to think that poor oral health doesn’t pose a real threat. But in fact, the burden of oral diseases and conditions in the United States is extensive and affects people throughout their life span. Birth defects such as cleft lip/palate, dental caries, and facial trauma are common in the young. Periodontal diseases, autoimmune disorders, and other chronic disabling conditions are seen in adults while complete tooth loss and oral cavity and pharyngeal cancers are seen more often in older Americans. 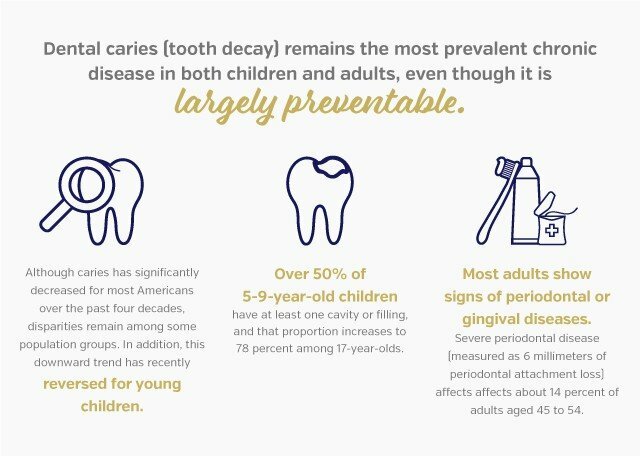 Over 50 percent of 5-9-year-old children have at least one cavity or filling, and that proportion increases to 78 percent among 17-year-olds. Because the most common oral disease, dental caries, is so widespread in the population, nearly every American has experienced oral disease. The message is clear: Practicing proper dental care is important in many ways you might not have thought of before. Encourage your family to practice good oral hygiene by brushing after every meal with fluoride toothpaste, flossing daily and using a mouth rinse to kill bacteria. You should also visit a dental professional regularly for cleanings and the prevention and treatment of cavities. Doing so can protect more than just your teeth – it can save your life. Your dentist, for a number of reasons, is the ideal health provider to identify and help manage many issues that contribute to inflammation and to systemic health. With a structured approach, they can identify, diagnose, and treat some of the most important inflammatory contributors. Regular visits to your dentist can do more than keep your smile attractive – they can tell your dentist a lot about your overall health and wellness, including whether or not you may be developing a disease like diabetes. Elite Dental of Staten Island is a completely independent community-based practice in Staten Island, New York. Led by Dr. Steven Acker, Elite Dental of Staten Island is the leader in practicing, studying, and educating patients on the relationship between comprehensive oral health and total body wellness. We tailor unique treatment plans to improve the quality of life of each and every one of our patients. At our practice, impersonal healthcare procedures are put aside and instead, we embrace a new way of healing. Dr. Acker and his team always put the patient at the heart of everything they do. We are leaders in practicing, studying, and educating patients on the relationship between comprehensive oral health and total body wellness. As a member of the American Academy for Oral Systemic Health (AAOSH), Dr. Acker prides himself on continued education for himself, his staff and his patients in regards to this particular correlation. We know that your smile is distinctive and as unique as you and your personal story. And, because we are all different, your wellness should be designed specifically for your needs, your goals and your aspirations.